The the Concept 2 combines a high output of 6,500 lumens with a super small form factor with two-stage (camera shutter) style UI (one of my fav interfaces) while also sporting the sleek and smooth appearance of the “concept” series. Overall, I like the light a lot and love the output and the small form factor. I also like the UI except there isn’t a shortcut to ultra low which seems valuable for a very high output light. What I don’t particularly like is that the body does not have enough grip, even the C1 had a little knurling. I was surprised that the package doesn’t have all the standard runtimes table and such but it has the basics on the back. 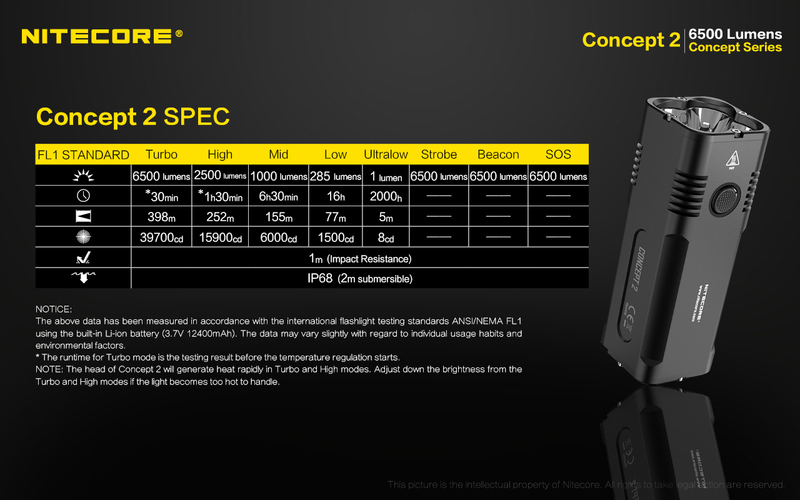 This is the only version but still waiting for Nitecore to release a neutral tint in quad format. Overall, the light is very smooth except for the the minor heat fins on the head. I’d prefer a little more grip than what’s offered; perhaps some could be along the chamfered edges; you could even purchase some stick-on rubber grips. Other thoughts: this light can actually fit in a reasonable jean pocket, switch is very tactile and easy to find, solid tail stand, and pretty tight lanyard hole. Still waiting for a para cord sized lanyard hole. 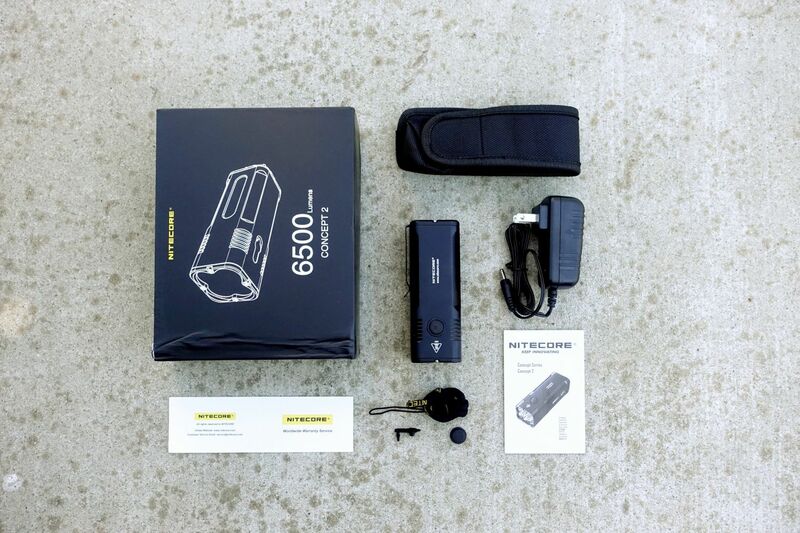 The standard package comes with a few accessories chiefly a nylon holster, with hook & loop closure, and a deep-carry, sturdy, screw on pocket clip. The holster has 3 attachment options, belt-through, over the belt, and d-ring. The holster flap is a little long so you need to pull it tight. My main grievance is that the light can only go in, and easily out, with the pocket clip facing the back of the holster. The pocket clip is very sturdy but is oriented to the wrong side for a typical draw with the right hand. 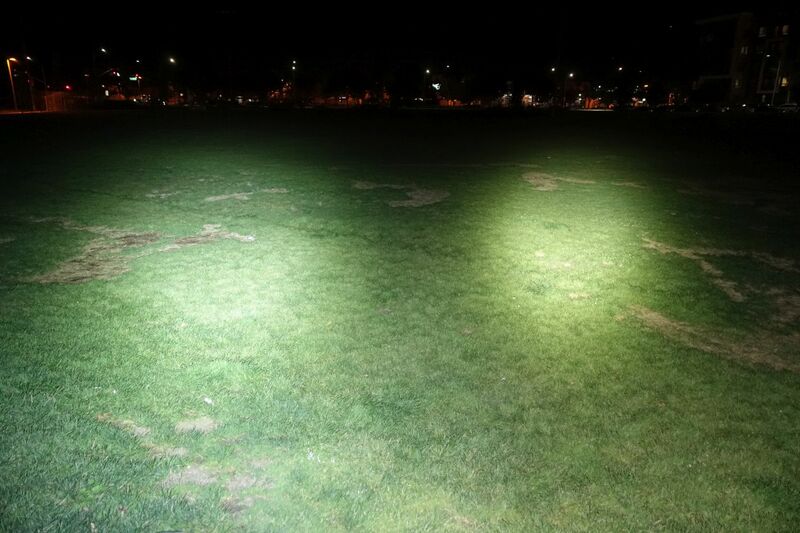 The light uses four XHP35 HD LEDs made by CREE. The light has a 18 degree FWHM beam angle. This is the angle at which light output has reached 50% of maximum. 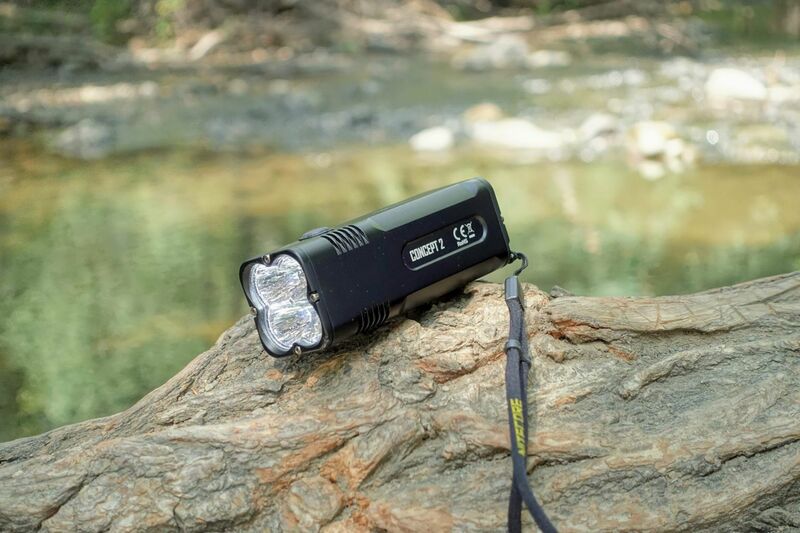 With a high-output light like this, 1% of output (65 lumen) is generally usable light, therefore you could consider the total spill beam angle to be about 90 degrees. The light has a built-in, non-serviceable, 12,400 mAh battery split up into 4 cells. Usually the reason for this is for increased performance but also helps reduce the body length. The power switch has an indicator light that can indicate the battery voltage and can notify of the light being locked out. It also blinks rapidly when the battery is almost depleted. It takes about 5h 20m to charge the light. The light uses a barrel pin connector to charge the batteries and a wall adapter is provided. 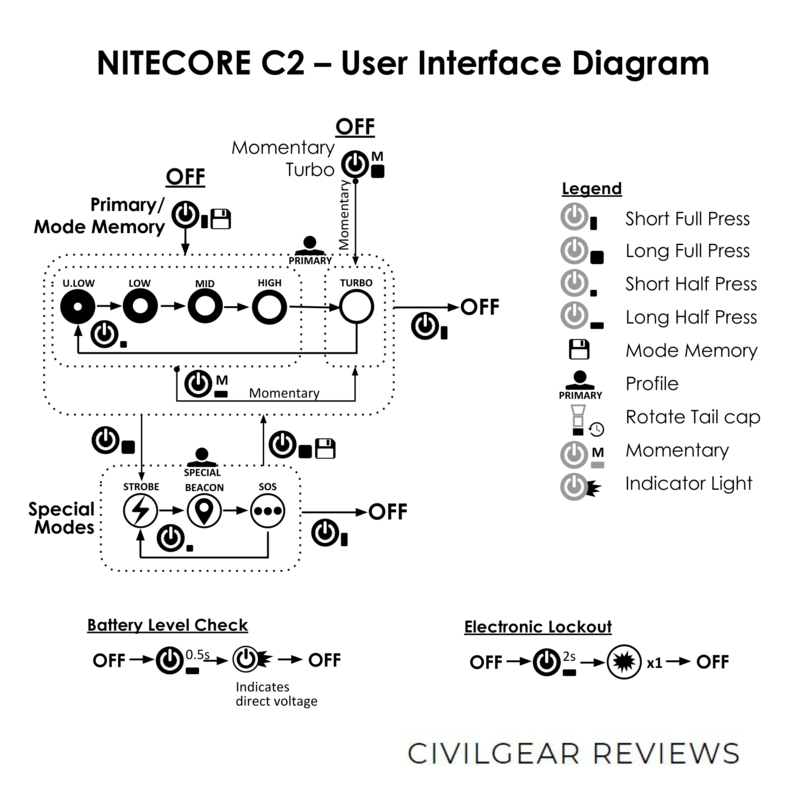 The power supplied is 12V at 1A, which is what I measured, but summing the current I reached a much lower mAh capacity, but after talking with Nitecore, I found out that there is a switching circuit which ups the current, to my guess of 2.5A. 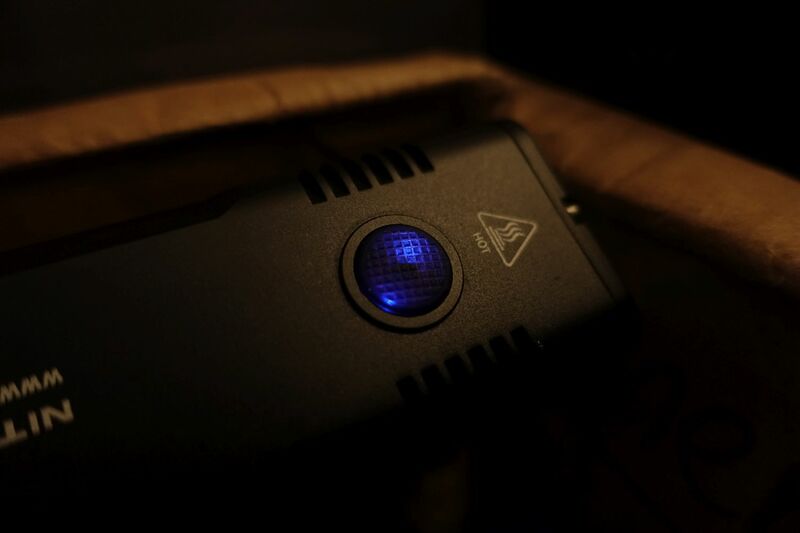 The light lasts about 45 sec on Turbo before steping down to 12% output at 1m 20s. When the light is blasting at turbo I do hear a faint noise. A max body temp of 133°F and out-the-front temp of 252°F was observed for starting in TURBO which can probably catch something on fire. There appears to be no significant PWM on any constant mode. 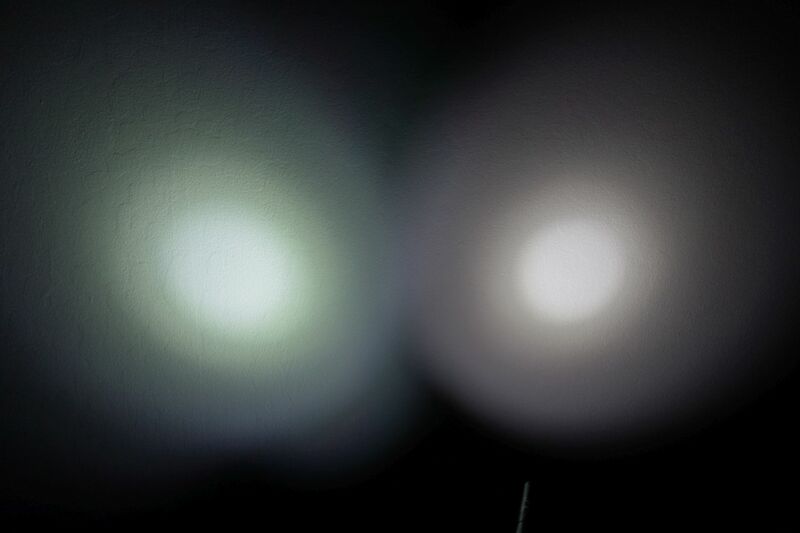 For comparison, the third graph shows PWM varying from 0 to 120 lx on the LOW mode on the Nitecore R25 flashlight. Strobe frequency is about 18hz. Frequency is 1 flash every 2 seconds. No shortcut to ultralow or low means you have to cycle through turbo! There’s lots of quad LED lights out there but I can’t recall seeing such a compact and square one. 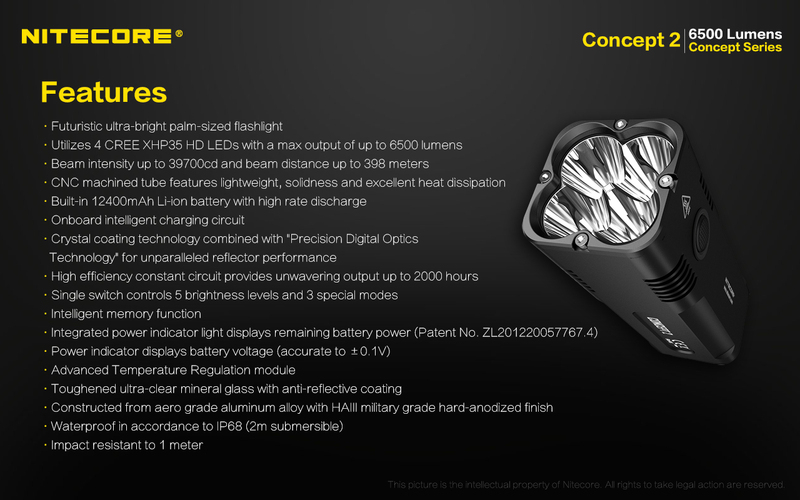 Nitecore’s TM28 is about the same output but is a bigger body. 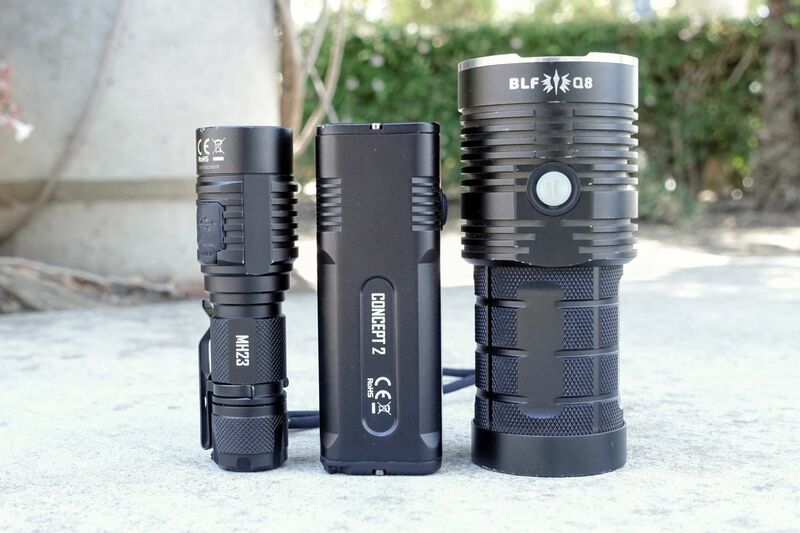 For fun here’s a comparrison pic of the C2 with the very popular BLF Q8 which has almost the same output but is a much bigger body, and next to the Nitecore MH23 which is a comparable length.